The homeowner loves luxury and glam so that much she desired her house interior to be designed into that kind of style. 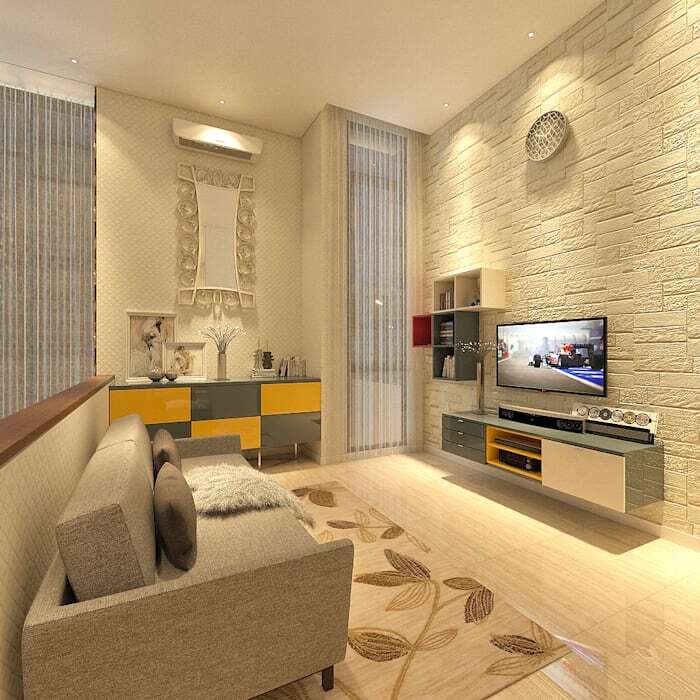 She wants to surprise and impress her guest from one room to another with modern interior and lots of ornaments. The living room is covered in a multiple tone of rose gold color on the floorings, rug, and walls. 2 pieces of artworks placed on two sides of the room as luxurious decoration alongside with the mirrors installed on the wall panel. The color that dominated the whole room also a warm feeling as we walk in. Luxurious vibes are always present in each room of the house. We chose trendy pieces of furniture followed by different wallpaper with an elegant pattern that successfully brought out a surprisingly dynamic sensation every time we enter the room. Decorated by the sparks of mirror panel covered walls and also the bedside mirror table, the bedroom looks very slick and modern. Geometric pattern rug beneath the bed makes it an eye-catching center of the room. In the kid's bedroom, the atmosphere is slightly different. It gives a warm and modern ambiance with minimalist furniture and bright color scheme all over the room. Some quotes are written on the walls of the single bed makes it the most stand out part of the room. Also some illustrations of the kid’s favorite cartoon character on every side of the room.